Flexible recipes are a busy cook’s dream. There is nothing better than a dip that can morph into a sauce, or a salad that becomes your breakfast smoothie. Caponata, a recent discovery for me, exemplifies that flexibility. The various recipes that I have tried, have found their way onto cheese platters, and antipasto plates. They have been wonderous sides for grilled meats and recently a rich topping for quesadillas. This particular recipe is complex, bold, and compliments so many other dishes. Next time, I want to make it into a pasta sauce with a few zaps in my Cuisinart. Topped with some freshly grated Parmesan cheese, this would make a memorable meal, I am sure. I am bringing a huge bowl of my Caponata and my favourite rustic fig and anise bread over to Angie’s Fiesta Friday tomorrow. Come and join us at the best virtual blog party on the web! While I have tried a couple of excellent recipes for Caponata, this recipe is from Bon Appétit‘s June 2015 issue. The dried cranberries and fennel added a sweet spiciness that I just couldn’t resist sharing with you. Served with rustic breads, this makes a hearty meal. Toss the eggplant cubes with 2 tablespoons salt. Place in a colander and set over a bowl. Chill for 3-10 hours. Place eggplant in a kitchen towel and squeeze out the excess liquid. Combine the eggplant, fennel and vegetable oil in a large, heavy pot. Set over high heat and cook, stirring occasionally, until the eggplants are golden brown and the fennel is soft, about 20-25 minutes. Transfer to paper towels to drain. Let cool slightly. Meanwhile, toast the pine nuts in a small dry skillet over medium-low heat, tossing often, until golden brown, about 4 minutes. Transfer to a plate to cool. Heat olive oil in a large skillet over medium. Cook onions, chiles, and garlic, stirring occasionally until tender, but not browned, about 6-8 minutes. Stir in paprika and cook until fragrant, about 1 minute. Add the tomatoes, vinegar, and sugar and bring to a boil, stirring to dissolve the sugar. Add the cranberries, nuts, and eggplant mixture. Toss until heated through and glazed. Season with salt. Let cool. Serve with the bread, crackers, cold meats or cheeses. Enjoy the flexibility of this lovely Italian dish. Flexible recipes are perfect to me whether you’re a busy person or not. I love love playing with recipes – changing them up – making them Indian or Southwestern, or just changing ingredients for the sheer fun of it. A lot of people, in my experience with cooking classes, have no idea how to do this because they’re only capable of following a recipe to a tee. Great recipe!!! Such an interesting name, and I thought it gonna be something complicated, and I was glad to discover such easy and flexible recipe! Thank for sharing, Julianna! I’ve never tried or made caponata, I think I should! Do you wash the salt off the aubergine chunks? Okay…does that make it really salty though? Nope. If you squeeze them well, it’s not salty at all. Yes, you should try it for sure, Elaine. And no, I didn’t wash the salt off. So much water comes off as the eggplant drains and then you pat it dry, so most of the salt comes off. I was a bit worried that it would be too salty, but it was not. This looks delicious! Colorful and healthy! 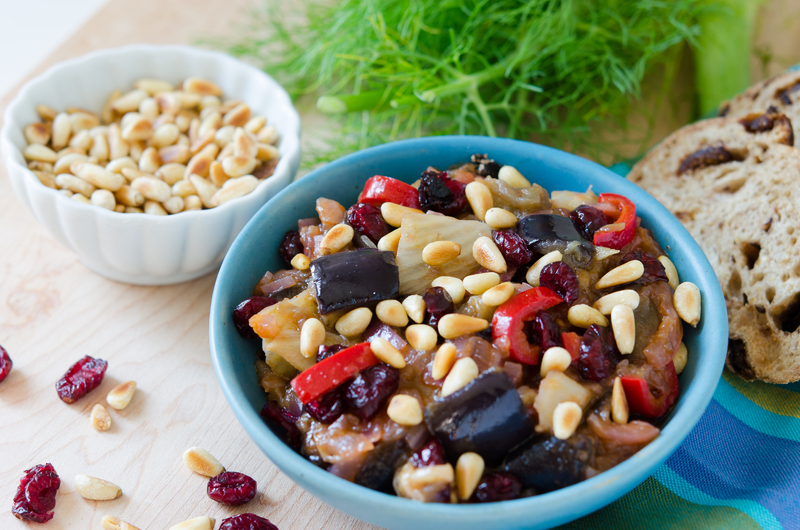 I always adore finding new eggplant recipes, and this caponata sounds divine. This recipe has so many delicious ingredients…I really like a bit of sweetness in savoury things and I love the flavour of toasted pine nuts. What a perfect dish to bring…and happy Fiesta Friday! I love caponata! It’s one of my favourite dishes!! Thanks Dini! I had never tried it with fennel and cranberries before either, but it really works and is super Delish! This sounds great–I love the variety of ingredients! So happy that I made something that is beckoning to you, Lili! Enjoy! 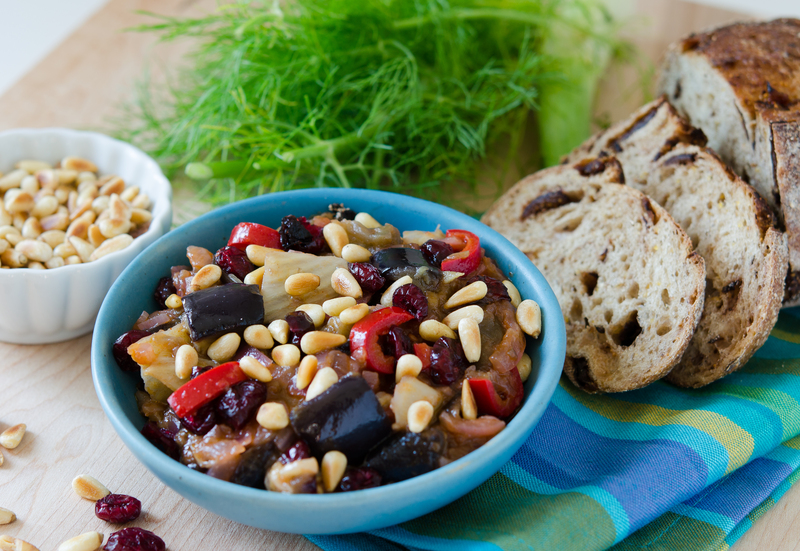 What amazingly fresh ingredients in this caponata. Do you ever use the greens of the fennel? Love the licorice taste it imparts. Glad you think so, Chitra! 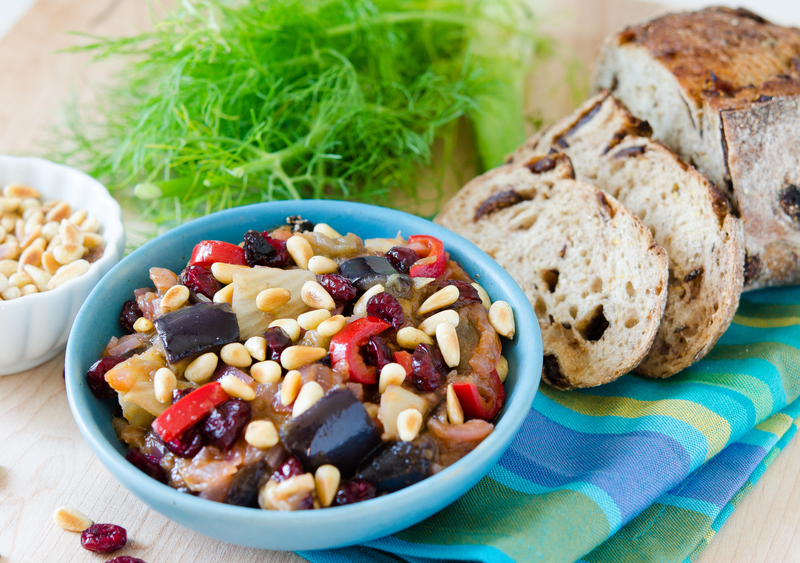 This caponata recipe looks so wholesome and tasty! Love all the ingredients that go into this. ! Caponata it means summer for me. This is one of the most famous Sicilian recipe, and as you said it is memorable. Your photo is very rappresentative of its quality! Love that it isnt too complicated too. Q. Is Caponata one of those dishes that ‘anything’ goes? This looks great! I absolutely love caponata! Thanks so much Sabrina! It really is a lovely caponata!